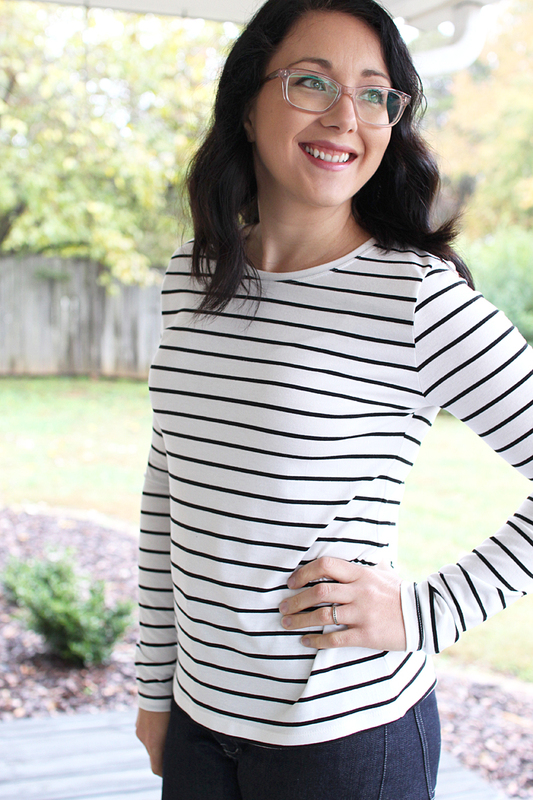 I'm talking ALLLLLL about this amazing stripey fabric over on Tammy's blog, so head HERE to read that post and see all FOUR(!!!!) shirts I made from this fabric! And then come back here to find out more about this all handmade outfit that I'm wearing. I feel like this outfit has unlocked some sort of sewing level for me. 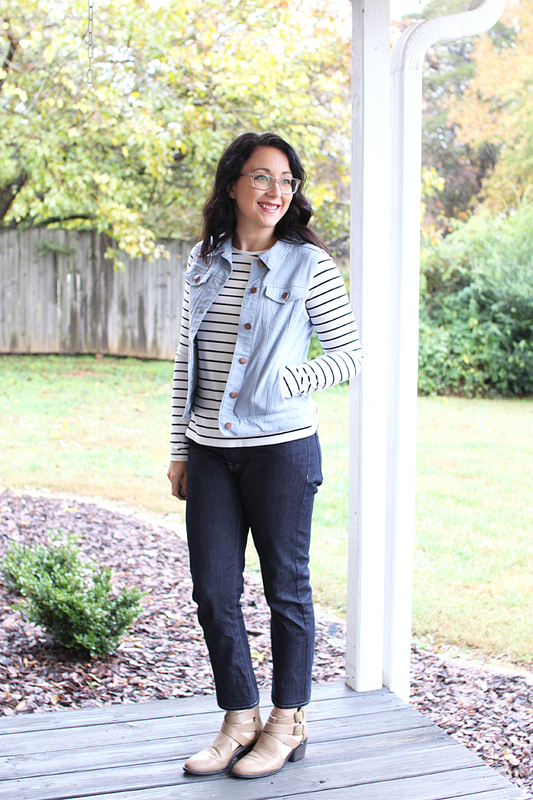 Head to toe denim handmades, and the PERFECT striped tee to accent it all. Yep. That is some good stuff!! 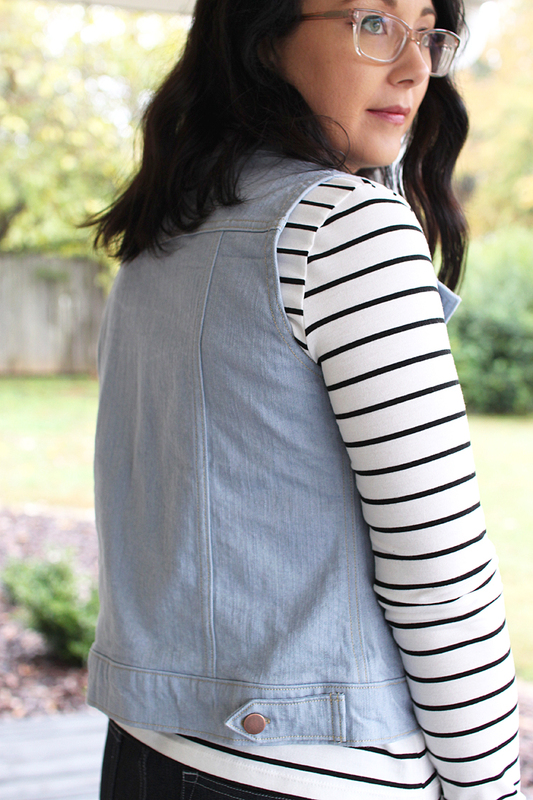 What I especially wanted to highlight today, is my Hampton Jean Vest. 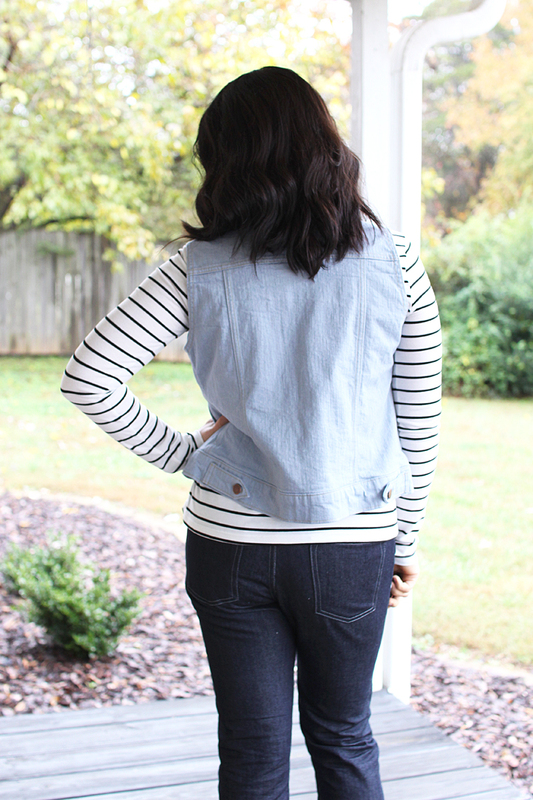 You may remember that I've sewn a Hampton Jean Jacket previously (see HERE), and I wear it all the time! Well, I got bit by the bug again and decided to try my hand at hacking the pattern into a vest!! 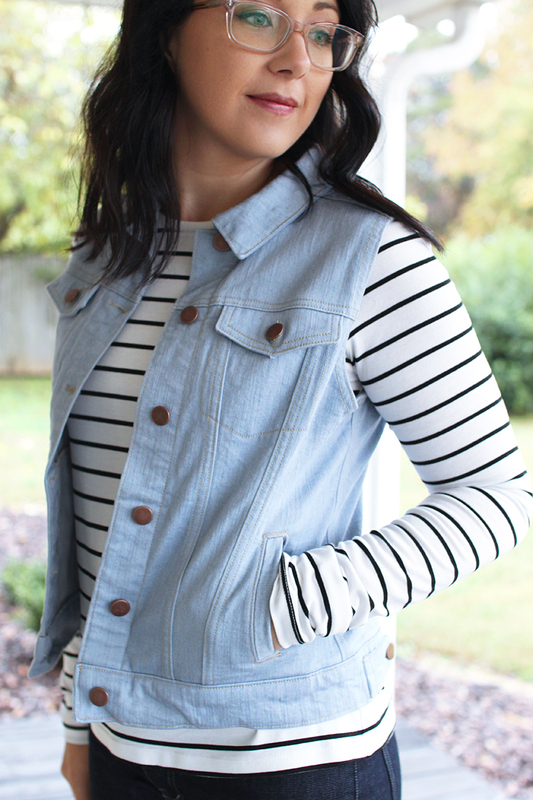 This summer, I ran across a very similar jean vest from Target, and actually ordered it to be delivered to my house. I was pretty excited about it, because I'd been searching for a vest like it for quite a while. Well, as you can probably guess. It didn't work out! The fit was all wrong, it was oversized, too long, and just not at all how I had envisioned it. So back to the store it went and I vowed that day that I would make my own! 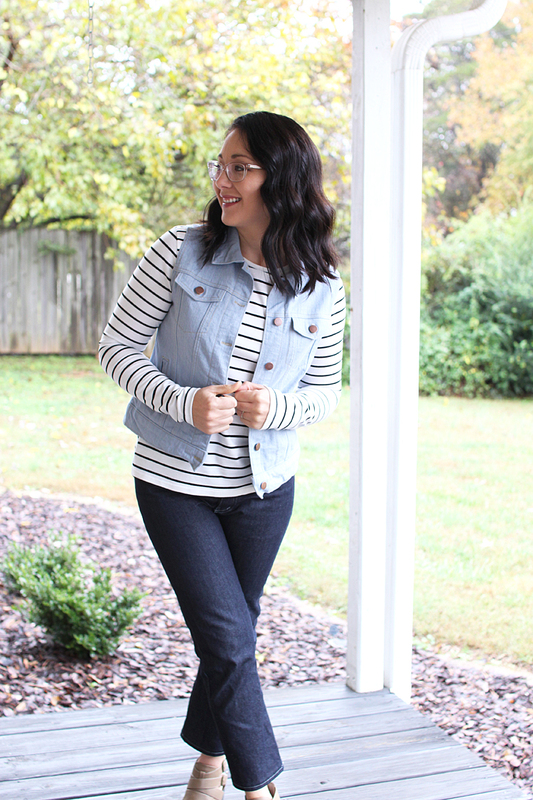 We both used the Hampton Jean Jacket pattern, and made a few very simple changes to create a vest. 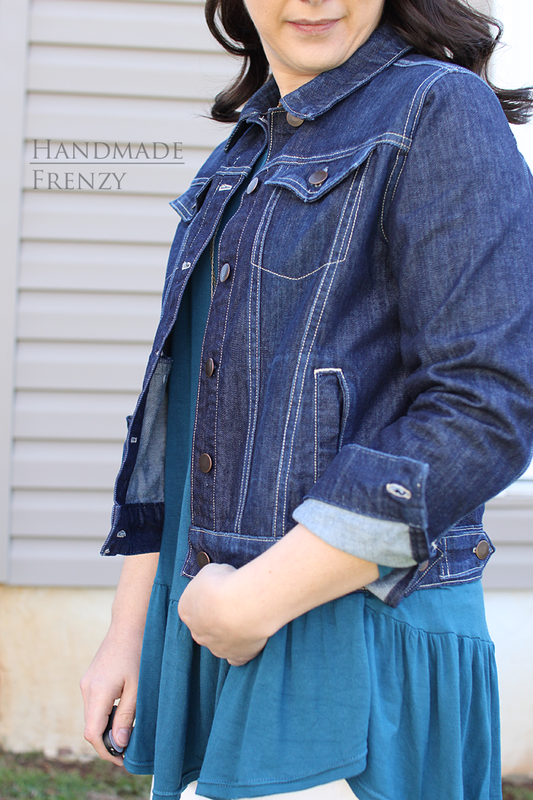 The first important bit of info is that I used stretch denim, also from D&H Fabrics. 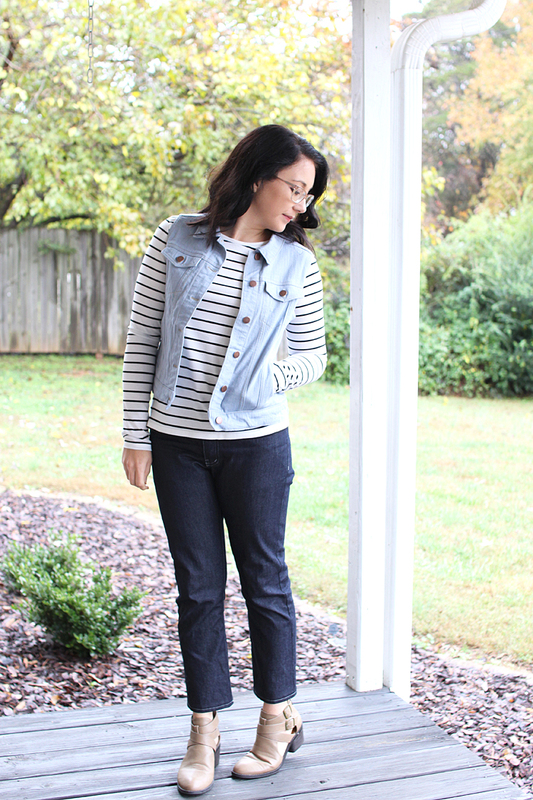 It's the most amazing slub Italian denim, in the perfect light wash color. 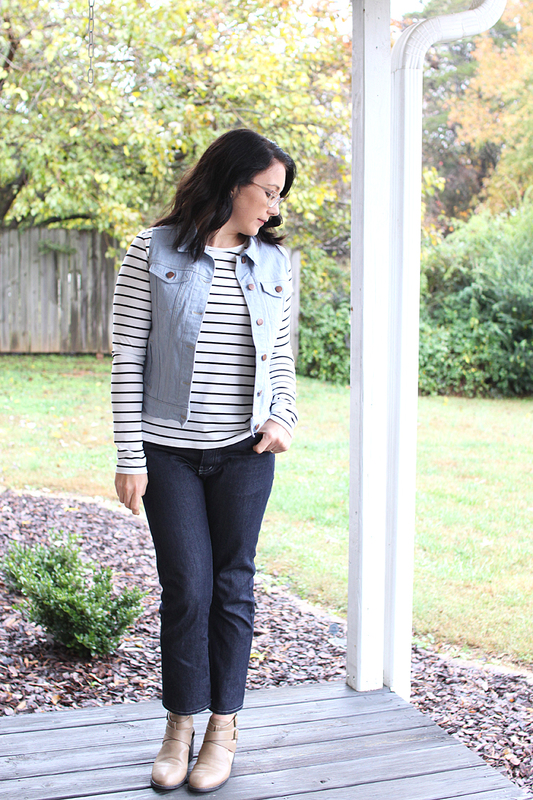 The weight is great for a vest, jacket, or a pair of jeans. I made sure to buy plenty so I could make a pair of jeans from what's left. And no worries, I won't be wearing them together! Lol. 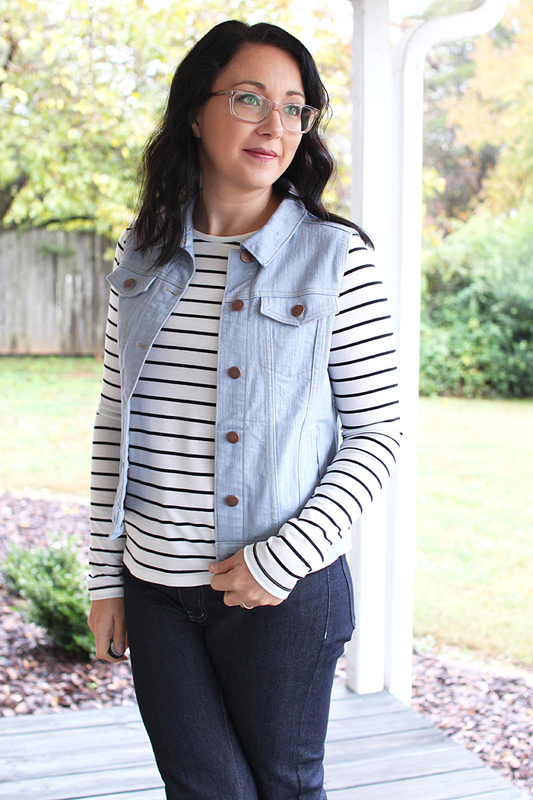 While the denim has plenty of stretch to be perfect for a pair of skinny jeans, it also worked really well for the vest, which is a pattern intended for non-stretch denim. Since I wanted the vest to be quite a bit more close fitting than my jacket, AND I was using stretch denim, I knew I'd have to do a bit of sizing adjustments. This was very straight-forward. To start with I simply cut 2 sizes smaller than what I had made my jacket. 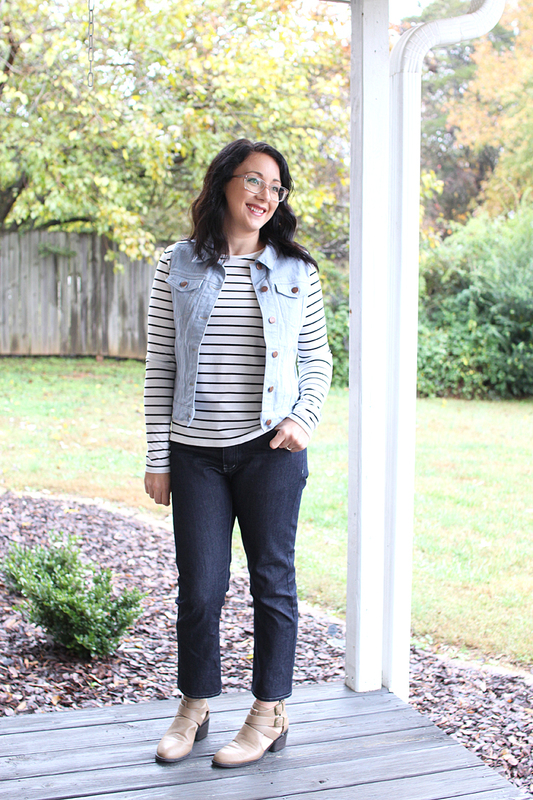 I did think that I could probably get away with going down 3 sizes, since the denim had stretch, but erred on the side of caution and only went down 2 sizes initially. I should also mention that the jacket I made was in a size 8, and I was between a size 6 and 8, but chose to go up. So that meant I knew confidently I should size down at least 2 sizes. The next bit of adjusting I did was to shorten the pattern 3/4". I think I could have even shortened a bit more for it to pair better with dresses, but I'm still really happy with it as is. The last step of fitting was to adjust the armhole depth and width. I don't have an exact number here for you. My notes just say the I adjusted A LOT. Hmm. So very helpful. Lol! I will say that since I took in the width of the overall bodice so much, the armhole was definitely high and quite snug at first. But I just trimmed away until it looked the way I wanted it to! And no, I didn't transfer the shape to the pattern pieces, in hind site it may have been helpful, but since each denim is so individual, I think I'll plan to just fit as I go if there is a next time. 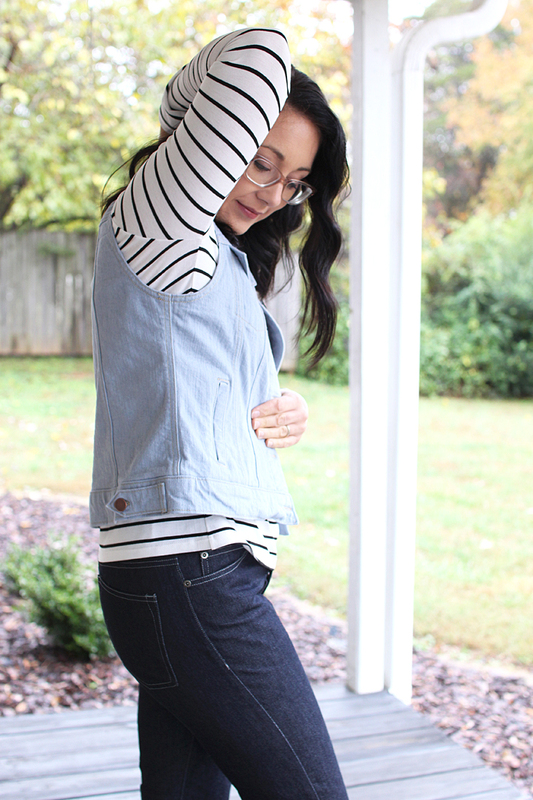 Denim jackets are labor intensive, y'all!! But oh so worth it! I love both of my Hamptons so much. 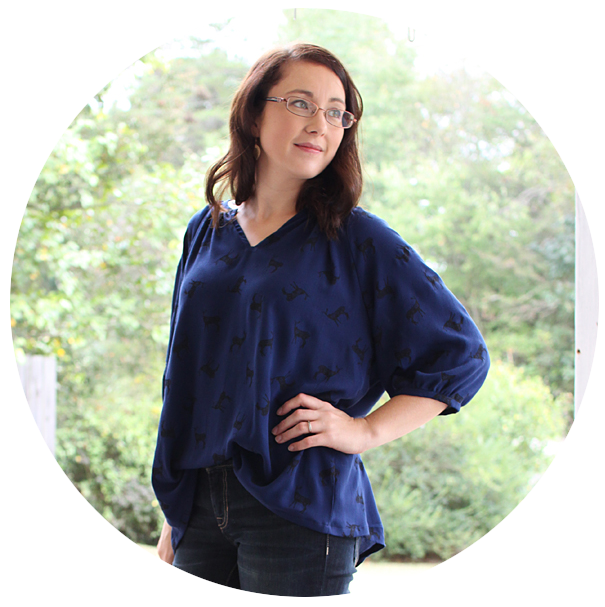 Since this was my second sew-through of this pattern, I feel like it went quicker than the first. Muscle memory, or whatever. However, it's like giving birth. You forget how intense it is until you're in the process again. Ha. The biggest tip I learned this time around was a flat-felled seam trick. The first time I sewed the jacket, I used wonder tape to keep things laying correctly without using pins. This worked pretty well, although I did still have quite a few places where it didn't quite catch, and I felt like I was really using a lot of the tape and was feeling guilty about all the $$. This time, the idea to use Elmer's glue stick popped into my head! And it worked really, really great! I'd say it worked better than the wonder tape, I only had 2 little places where my topstitching didn't quite catch. It is definitely a bit more messy though. My fingers felt like they had spent the day in kindergarten. :) And the tip of the glue stick was covered in threads by the time I was finished, but I have been using that glue stick for so many things since then. So handy! I was unsure on how to finish the armholes. I planned to use bias tape because I had inspected the vest from Target to see how it was constructed, they used self fabric for the bias, but I felt like my fabric was a bit too thick to make it through my machines nicely. So I searched my stash for something appropriate and thankfully found a tencel denim in almost the identical color and used that to finish things off! It looks lovely on the inside and unless you look really closely you wouldn't even be able to tell it's not self fabric. I don't have any personally experienced, brilliant, button-hole sewing tips for you, although I really wish I did! Let's just say my Bernina is great at a lot of things, but she likes to act up when I ask her to sew button holes on denim! I intended my vest to only be worn open anyway, so I gave the button holes a shot and settled for good enough. Nobody could ever tell they aren't quite all the same size or that the bottom button hole is juuuuust a tad, ok, it just is... too small. Except now you know because I spilled the beans. And I tell you this so that you can hopefully be encouraged to let things go every now and then if you are a perfectionist. 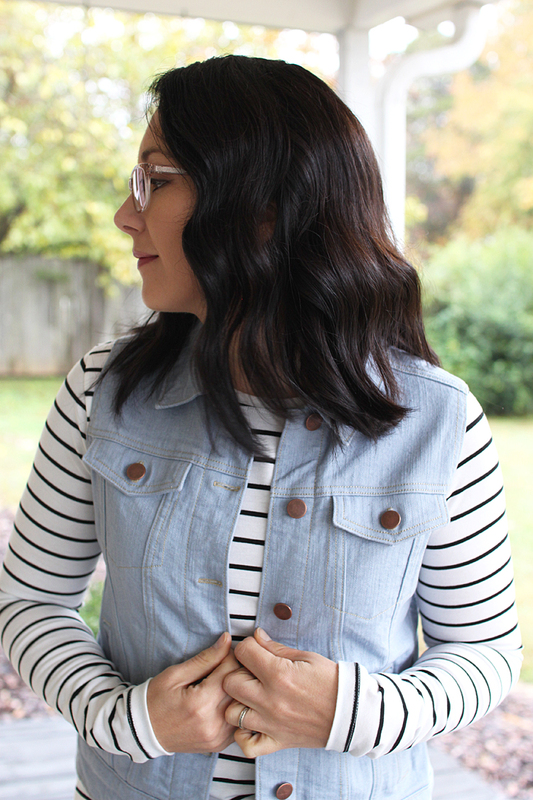 I am a perfectionist, but I'm coming to learn that there are certain things that only I will know (unless, ahem, I tell the whole world here on the blog), and some of those things are just okay. I honestly can't even tell that my button holes are wonky, I've forgotten about it, unless I fiddle with the bottom button, which I sometimes do... But then it's just a reminder that I made this thing with my own two hands and I'm stinking proud of it! 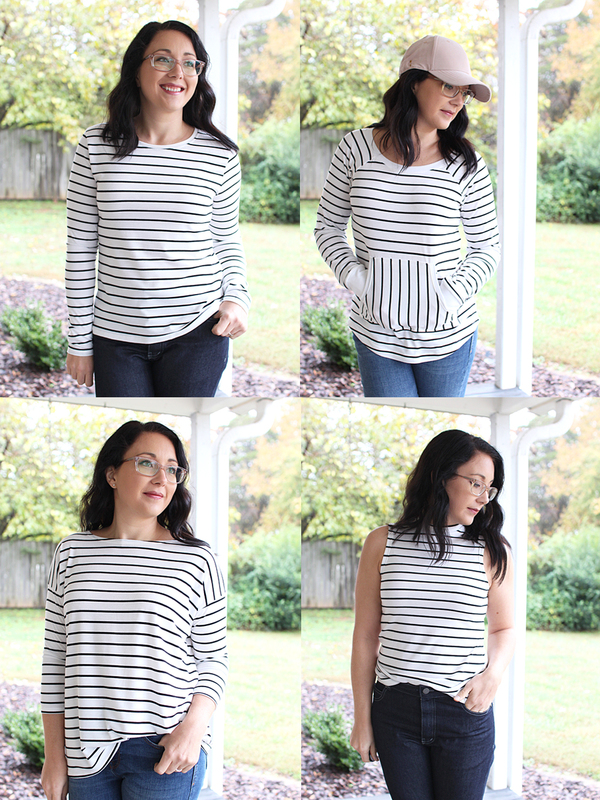 Today on the D&H Fabrics Co blog, I'm writing all about the four tops I made using this lovely striped tri-blend jersey. I've written most of the pertinent information in that post, but I'll be showcasing each pattern in it's own post here on the old blog-o as well. There's not really a whole lot to say about this particular pattern, except that I really truly. love. it. It's a TNT pattern for me in both the dress and the tee version. It fits so, so well. 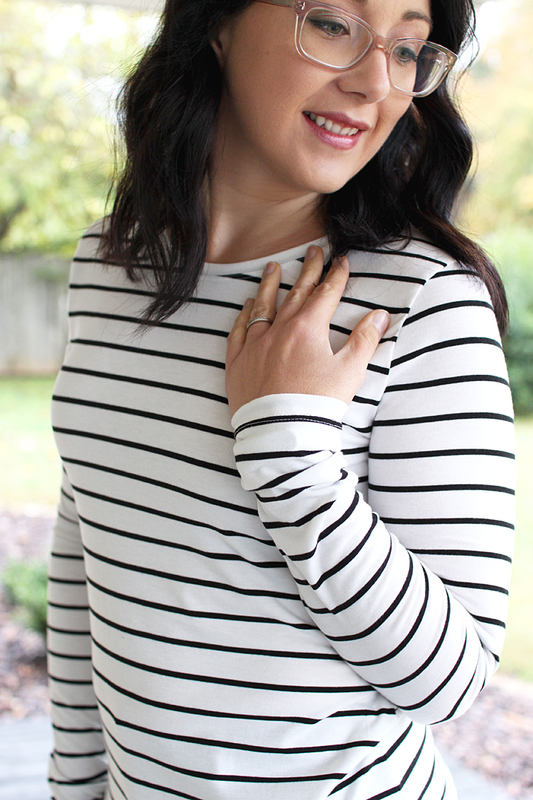 It manages to be fitted and flattering, without clinging to any of my problem areas and accentuates all the good parts at the same time. 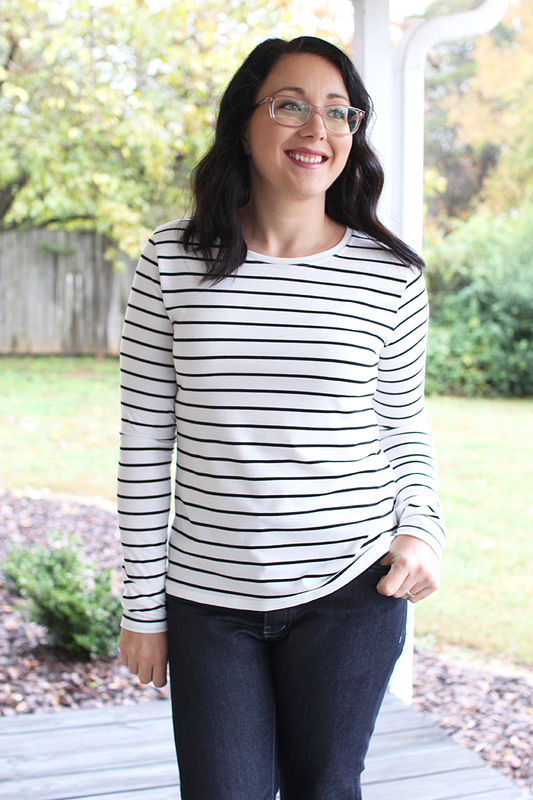 What's better than that in a basic tee!? Nothing. Nothing at all. For this shirt, I sewed my standard size 6 and shortened the bodice 1/2" inch. 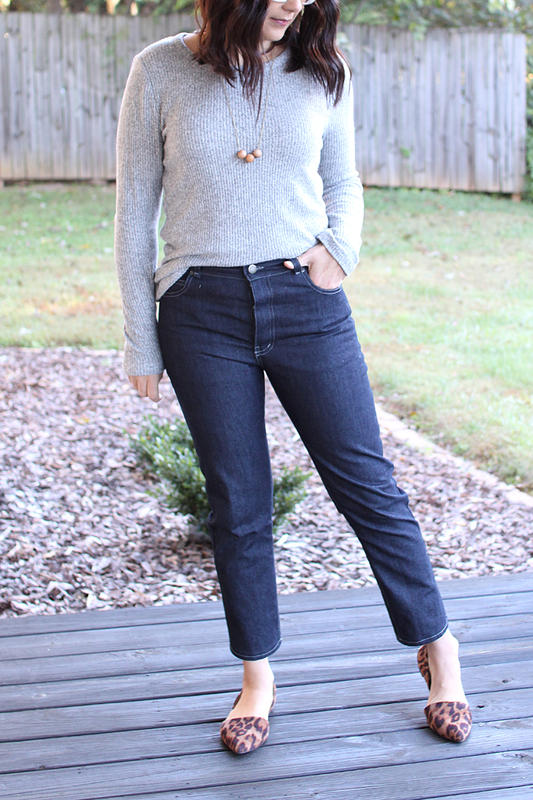 The jeans I'm wearing are my newest me-made pair, the Dawn Jeans by Megan Nielsen. You can read all about them HERE. I also have more info saved in my IG stories highlights on my profile HERE. I love them so much that I've ordered 2 more cuts of denim for more pairs and *happy dance*, it's supposed to be arriving TODAY!! And now with that, I think I will end this super wordy post!! If you have made it to the end, you truly are a rock-star and deserve a prize! Especially since I'm drugged up on cold medicine and am feeling super chatty-tired. That tee is really is THE ONE. The whole outfit is great!